Joomla VirtueMart RMA : This splendid add-on has the feature which provides authorization to user in managing the concept of return and exchange in store. The process is a part of returning products in order to receive return or replacement based on admin’s configuration. For a purchase with multiple products in single order, customer has the opportunity to return single or multiple items depending on admin’s configuration at backend. Joomla Virtuemart RMA is working in Joomla version. After downloading and extracting the zip file , go to Extension Manager. Browse and select the zip file, upload and install. Once installation is done successfully you configure the Joomla Virtuemart RMA accordingly. Set the feature of replace/return or select both to allow user to request for it. Select “yes” to allow replace/refund of product only in a request. Select “yes” to allow additional communication box at frontend. Set the time duration of return of product. Select “yes” to allow cash on pick up. Click on “+ New” to create a new reason category as shown below in snapshot. Set the title of the category, type down the description of it and select the condition applicable on the category as shown below in snapshot. Click on “+New” to create reasons for the category created as shown below in the snapshot. Set the title of the reason and select the category as shown below in the snapshot. Click on “Return request” to view the details of the requests generated for return as shown below in the snapshot. Set the mail template as shown below in the snapshot. When the status of order is “confirmed” then RMA facility is available to user. Go to “Order” and click on the order number to avail the feature of RMA. Click on “Request a replacement or a refund” tab as shown below in the snapshot. Select the product you want to refund or replace by clicking on the button below as per requirements as shown in the snapshot. User can select the reasons for return from the list provided by admin. The option of additional comment box is provided for user to leave a message for admin. Click on “submit” to submit the request as shown below. User will receive a notification regarding successful return request as shown below in snapshot. Go to return request tab and click on return id to view the request as shown below. 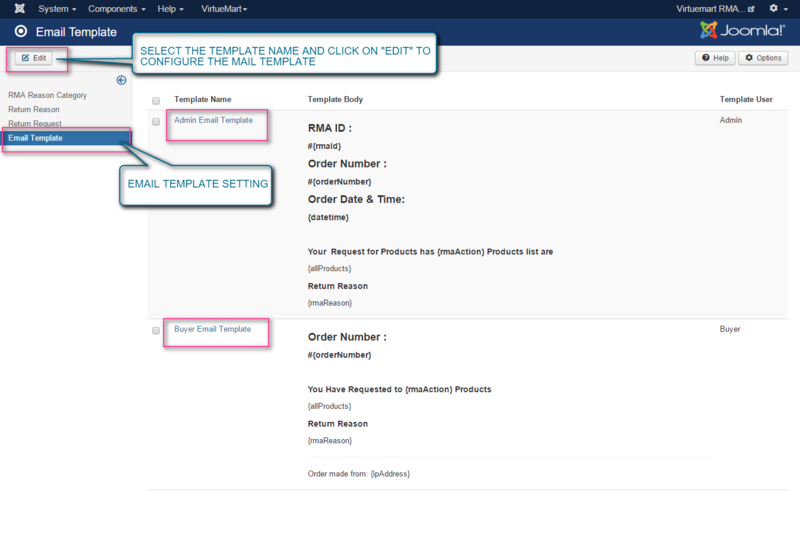 Select product and click on any field as per your consideration as shown below in the snapshot. In “declined products” admin can view the list of all the products whose requests have been declined. In “replaced products” admin view the list products that has been replaced. View the list of products that has been refunded in “refunded products” tab. Via “communication” tab admin can communicate with the user of that particular order. Admin can also view the conversation anytime as the conversation gets saved shown below in the snapshot. Click on RMA History to view the details of return requests. Click on desired “Id” to view the request order as shown below in the snapshot. declined products details from admin in “declined products” tab. products that have been replaced by admin in “replaced products” tab. refunded products will be listed in the tab of “refunded products”. In “Communication” tab user can communicate with admin and can view chat history as shown below in snapshot. hi, my question: does attachments (phots/file) are allowed? I like the new RMA because such a plugin was missing for yours to make VM a professional shop system. Before bying I have some questions: how about return from users which have not created an account? About 70% in my store checkout as guest. Is there a way to do it? And how about adding return shipping labels. I mean that could be simple solved as a pdf which can be added to the mail which will be send to the customers. Can you implement those functions as well?